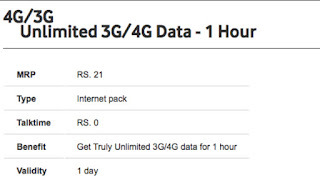 To counter Jio's strong run in the Indian telecom scene, Vodafone has announced a new prepaid pack that offers truly unlimited 3G/ 4G data access for a time period of one hour and a validity of one day. Priced at Rs. 21, this pack directly takes on Jio's Rs. 19 prepaid pack that offers 150MB of 4G data, albeit with a longer duration of one day. Unlike Vodafone's offering, Jio's Rs. 19 pack comes with unlimited voice calls, 20 SMS messages, and free subscription to Jio apps. So, while there are a ton of differences between the two similarly-priced prepaid offerings, the choice is clear. 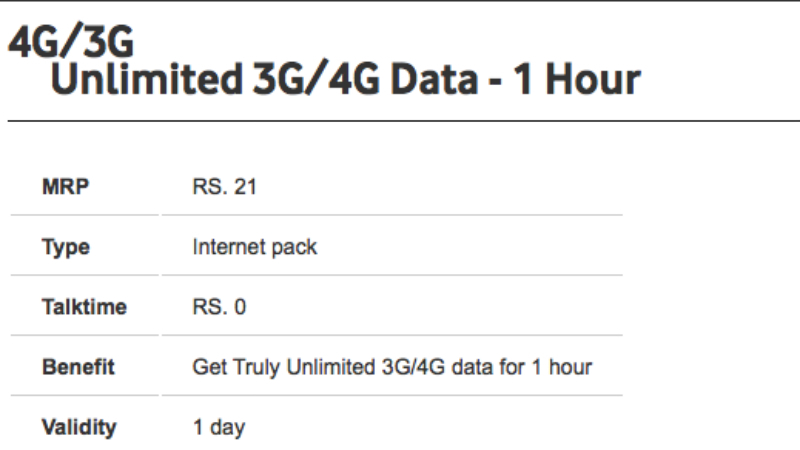 If the user wants high volume of data for a short period of time, Vodafone's Rs. 21 pack is the way to go. On the other hand, Jio's Rs. 19 pack is for users who wish to use voice and message services as well for the entire day. In terms of comparitive options with one-day validity, Airtel offers 1GB 3G/ 4G data access with the Rs. 49 prepaid pack. • Validity of the pack is one day. Vodafone recently introduced its new Rs. 299 prepaid pack that offers 1GB 2G data per day, 100 SMS messages per day, and unlimited voice calls (local + STD + roaming) with a validity of 56 days. The pack, however, is applicable only in the Madhya Pradesh and Chhattisgarh circle, where Vodafone's 4G coverage is currently not available.